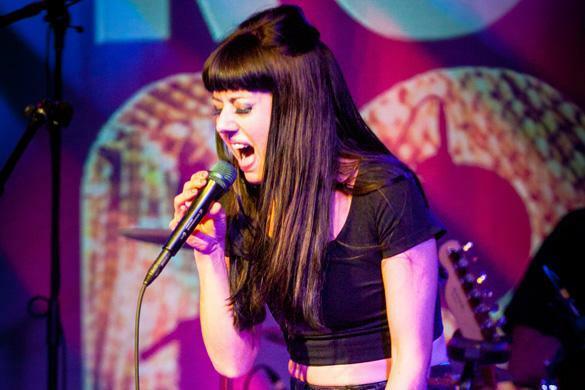 Ruby Rose Fox will sing locally Thursday and Saturday. The contralto voice is almost shocking at first. So low a register, it’s almost at a juxtaposition to femininity — and then, quickly, it’s effect is calming. It’s tempting to say Ruby Rose Fox sounds like Nico with the coo of a Francoise Hardy, but of course, Fox is fantastically her own thing: part stage actress, part power vocalist, part vaudeville bandleader, part lyrical poet. With dark hair — although it changes often — almond eyes, and a penchant for funky jewelry, she’s a chanteuse Cleopatra. The 33-year-old 2007 Emerson College grad captured female performer of the year honors at the 2016 New England Music Awards, and this year she’s a multiple nominee. At Saturday’s awards ceremony at Showcase Live in Foxborough, her first full-length album, “Domestic,” is up for album of the year. Fox is also nominated for rock act of the year and video of the year (“Domestic” producer Dave Brophy has also been nominated in his own category). Fox, who lives in Jamaica Plain, will be singing at the awards show, but before that she performs a full concert at the Isabella Stewart Gardner Museum on Thursday. The Globe caught up with Fox, nee Rachel Cohen, for a conversation that ranged from the impact of Leonard Cohen on her songwriting to the origin of her stage name to her days playing saxophone in a ska band. Q. When did you first start singing? A. I was 3 or 4 and saw an episode of “Great Performances” on PBS, it was the musical “Show Boat,” and after that I begged my mother for a microphone. She got me a Fisher-Price [tape player]. I started singing to Roy Orbison at 5 years old. I look back at my kindergarten idea of “What do you want to be when you grow up?” and it was always, “A singer.” I was pretty dyslexic as a kid, and my parents knew singing was something I was good at, and they encouraged me. A. I have an older sister, Jen. My younger sister, Dalia, died when I was 7. My singing also had to do with being so little, and having to deal with death, and not having any other way to express myself. I have over 40 cassette tapes of me singing random things into a tape recorder. I think the reason my voice became really rich and low is vibration in the chest calms the body down, and it was a form of self-soothing. Those low vibrations made me, literally, feel better. Q. Wow. So did you start singing right after graduating Emerson? A. I decided to not study music in college, I studied acting. After I graduated, I was psyched to be a theater actor. But I didn’t like a lot of things I was reading for — plays written with female stereotypes, and I didn’t feel like these characters were written for whatever my type was. I was up for these ingenue parts, and my voice is so low, I don’t sound like Juliet to casting directors. I started doing solo performance writing. I produced two one-woman shows, and became interested in my own artistic voice instead of other people’s. Once I started writing songs, I realized the effect I had on my audience was the effect I was seeking all those years with acting. Q. And what effect was that? A. When I opened my mouth to sing, the look on the faces of the people in the audience — I could see they felt something by the vibration of my voice. I just knew. And it was huge relief to know what to do when I woke up every day. I knew I was an artist, but I didn’t know what that medium was. Before that, I figured I’d be a Buddhist chaplain. Q. So Ruby Rose Fox — is that a stage name? Q. You were also in the ska/punk band Mass. Hysteria when you were a teenager. A. [Laughs] Yes, Mass. Hysteria. I was 14 when it started. We did pretty well; we played with some of the best ska bands out there at the time — the Slackers, the Skatelites, Hep Cat, Toots and the Maytals. We were all just kids; we had a special year of kids in our class [at Brookline High]. For the first two years, I just played saxophone; the guys didn’t know I could sing. I was a teenager, and not totally in tune with the actual timbre of my voice. When I did sing [in Mass.Hysteria], you can tell I’m trying to sound like someone else. You can hear a little Gwen Stefani. I wasn’t comfortable using my voice in the way that was most natural. I couldn’t accept that I’m a lady with a big, low voice.